Just like you, I love looking through Pinterest (you can follow my pages here) and last week I came across this super cute knitted wall pouch. I'm pretty sure it is the styling and photo that make this little wall pouch so cute, but it was a hit when I posted a copy of the image on my Facebook page. The original instructions were in German so I thought I would try to make my own version and share with you some English version instructions. Firstly - I just used what I had at home, so apart from my time it didn't cost me anything to make this. Secondly - I have tried to imitate this photo, it is not my original idea. Here is my finished version ... holding my very cute baby bear that I had as a child. I had 2 balls of this yarn I had used before - balls were not complete, so possibly one ball should be enough. Lionbrand Hometown USA Washington denim. Ribbon - grosgrain - grey that I had in a box of ribbons. Pom pom - I made this with some spare yarn. Get your stick... place near top of knitting and fold over so there is approximately a 7cm top fold. Sew edges up 3 cm.. allowing room for the stick to slide in. Fold up bottom edge of knitting until it is touching the top fold. Sew up sides using mattress stitch. When you reach top fold, sew the two edges together for approximately 2cm. Leave a large opening. Tie ribbon on one end of stick and adjust ribbon to find suitable length before cutting and tie other end. Attach pom pom if you have one. I have filled the pouch with a few soft toys, allowing this little bear to peep out the top. Arrange toys as you like. 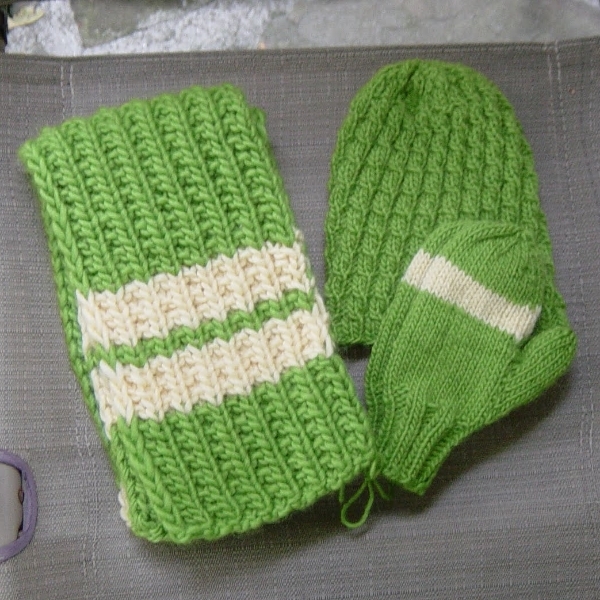 Because the yarn I used is Acrylic which is stretchy the pouch will stretch. If you have used a rope or very thick cotton yarn you will get less stretch. Either way it works well.